The primary financial assistance program is the Environmental Quality Incentives Program (EQIP). EQIP provides financial and technical assistance to agricultural and forestland producers. To participate, producers can apply for EQIP throughout the year; however, Illinois NRCS has established two application deadlines for November 17, 2017, and January 19, 2018. Producers are encouraged to submit an application by one of the application deadlines if they are interested in obtaining program benefits. Over the years, producers use EQIP to successfully address natural resource issues on their farm. Some EQIP activities include installing structures to address gully erosion, improving pastureland diversity by inter-seeding, and improving soil health by increasing organic matter with cover crops. These conservation practices can be completed using NRCS EQIP funding pools that target grazing land operations, confined livestock operations, organic, and wildlife habitat, just to name a few. 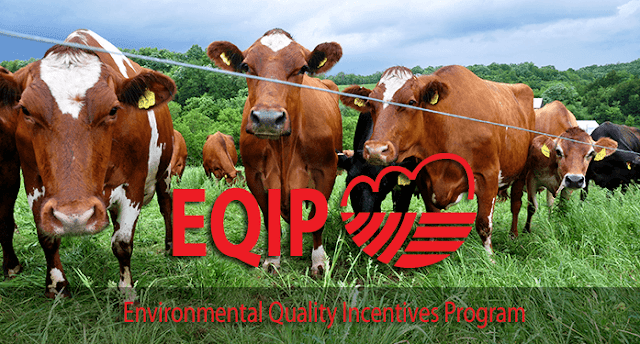 In addition to conservation practices, EQIP provides funding for the development of plans, such as Comprehensive Nutrient Management Plans (CNMPs), Grazing Plans, Drainage Water Management Plans, and more. Producers interested in EQIP should submit a signed application (NRCS-CPA-1200 form) to their local NRCS field office or submit one electronically through the Conservation Client Gateway. Applications submitted by November 17, 2017, and January 19, 2018, will be evaluated by NRCS staff for the funding period submitted. Applicants must meet program eligibility requirements to participate in EQIP. Local NRCS staff will work with applicants to determine eligibility and help answer ranking questions. If an application is ranked high enough to be funded, local NRCS staff will work with applicants to develop a contract and an implementation schedule. “Using science-based practices with EQIP is a powerful way to make changes that improve water quality and reduce soil erosion on Illinois farms,” Dozier adds. EQIP is a voluntary conservation program available to agricultural producers and forestry producers. Through EQIP, NRCS provides financial and technical assistance to install conservation practices. For information on EQIP, contact the local NRCS field office or visit www.nrcs.usda.gov/wps/portal/nrcs/main/il/programs/financial/eqip/.